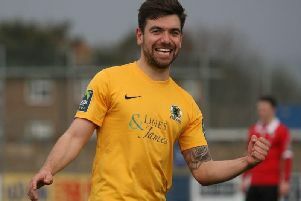 Haywards Heath Town boss Shaun Saunders believes his side have finally put to bed the disappointment of last season after beating Horsham YMCA 4-0 to lift the Peter Bentley Challenge Cup Final. This secured the league and cup double for Saunders’ side, just over a year after his side were deducted points for fielding an ineligible player which cost them promotion. Saunders said: “It was a tough one to get over. It took us a long time to get last season out of our system. Saunders was full of praise for his players, lauding his side’s attitude throughout the season. He added: “We’ve had an unbelievable journey this season. Highs and lows, it had everything, but we’ve always stuck to our guns. Saunders also had to drum into his players that after winning the league they had to stay motivated and bring home this cup but believed that his side were always destined to win the final.